It is a pretty exciting time to have joined the Opera family (by way of Opera acquiring Skyfire). Check out the new consumer rebrand that Opera just rolled out to Opera.com and the tech press last night, on the heels of last week's MWC 2013 announcement of a new Opera for Android app. The new rebrand is very north american targeted , with a huge focus on lifestyle and emotional connections with the target audience. 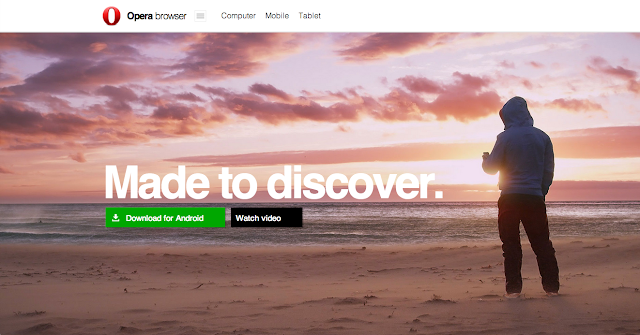 As part of the rebrand Opera has adopted a new tag line " Made to Discover". Go to Opera.com and watch the video to get a feel for the new brand direction. Personally i like it alot, since it seems to be targeting me as the demographic (Twenty something -thirty something males that wear hoodies, love smartphones, like European things, and live near a coastline, most importantly value a sense of Discovery and Wonder ;)). There is also a second video that is part of the rebrand, this video weaves in the surfer lifestyle messaging with showing off the top new features in Opera for Android: Speed Dial (with folders), Off-Road mode (data-savings), Download manager, new coverflow Tab view, new settings menu, and a single search/ url navigation box (since its based on the native android browser this last feature is not a surprise). I have read your blog its very attractive and impressive. I like it your blog.